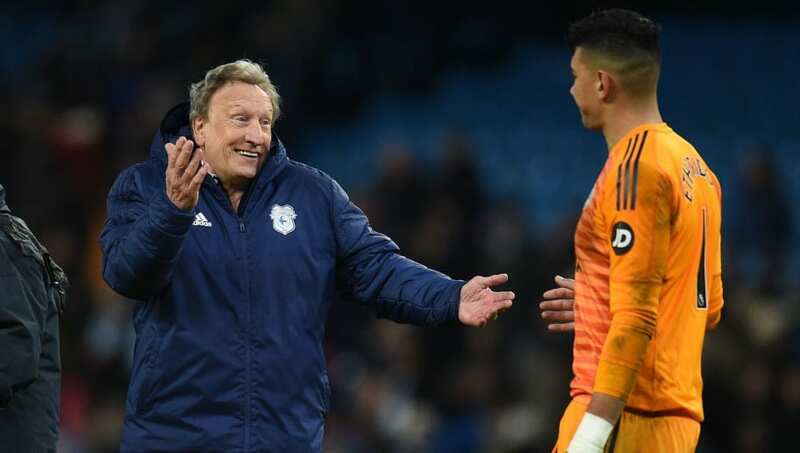 Cardiff City manager ​Neil Warnock has hailed his side's showing at Manchester City despite the champions recording a straightforward 2-0 victory. The Bluebirds were vastly outplayed on Wednesday night, being afforded just 21% of possession and having only one shot on target during the contest. First-half goals from Kevin De Bruyne and Leroy Sane sealed the points for the hosts as they returned to the top of the Premier League with the win. Conversely, Cardiff are five points adrift of Burnley who occupy 17th position in the table. Many would have predicted a rout following De Bruyne's sixth minute opener for the Champions League quarter-finalists, but the visitors showed resilience to maintain a respectable scoreline. Goalkeeper Neil Etheridge was outstanding, preventing further damage with a string of excellent saves. Though they rarely threatened themselves, Warnock was impressed by the attitude and application of his players during the loss. Speaking after ​the encounter at the Etihad, he said (as quoted by ​Wales Online): "I was just really proud of them. To concede a goal as early as that, you do fear the worst. "[​Manchester City] started like the ​Real Madrid of ten years ago. They're so quick, everybody's comfortable on the ball. We only had one day [of training] after the disappointment of the ​Chelsea game. "The circumstances could have knocked a lot of teams, really," the 70-year-old continued. "But they came to see me on Monday morning when I'd mentioned playing the Under-23s tonight and everybody told me, 'Gaffer, we want to play in this game!' - so that was nice." Despite the lack of attacking opportunities, ​the Welsh outfit fared much better in the north-west than some of their fellow strugglers have this season. In this campaign alone City have hit both ​Southampton and ​Huddersfield for six, whilst also racking up five goals in their thrashing of ​Burnley back in October.